If Coorg is your destination of choice and you love nature and enjoy serenity and look forward to rediscovering yourself and sharing special moments with your family, then Kadkani Riverside Resorts is the place to be. Kadkani Resorts captures the magic of Coorg and offers it to you in a serene and lasting experience. Hotel Kadkani Riverside Resorts is located on the banks of River Cauvery. Hotel Kadkani Riverside Resorts, a 4 Star quality retreat, is located on the banks of the River Cauvery at 10 km. from Ammathi in South Coorg. The resort is located in an area of 26 acres near the coffee plantations, out of which a golf course is formed in 13 acres. 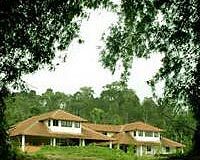 Kadkani River Resorts, Coorg offers 36 cottages. All the self contained cottages are spacious and furnished with simple sophistication. The cottages are equipped with all modern facilities and amenities. Hotel Kadkani Riverside Resorts has one multi-cuisine restaurant.